In 2001, the world was treated to a little gem of a game called Serious Sam: The First Encounter. It was an over the top shooter that harkened to such classics as Quake and Duke Nukem in which you could literally shoot 1000s of enemies in a level. The game was successful enough that it garnered two sequels. In November, Serious Sam 3 will be released and leading up to that we have seen several indie titles come out, the latest of which is Serious Sam: The Random Encounter. TRE picks up after the first game with Sam returning from the past and saying that the first encounter didn’t go so well. So, he’s sent to the future to battle the evil alien menace, Mental. But you don’t come to Serious Sam for its story, you come for its gameplay. TRE ditches Sam’s normal shooting mechanics, though, for 2D pseudo turn-based RPG/bullet-hell shooter action while still trying to retain the vast number of enemies and blatantly self-referential humor that the franchise is known for. So how does TRE handle its 8-bitification and the jump to RPG? The answer is “well.” But it’s also a good thing the game only cost $5. If you’ve ever played a Serious Sam game then you know that one of the key aspects to it is running backwards. TRE takes this and tries to translate it this new style of gameplay. 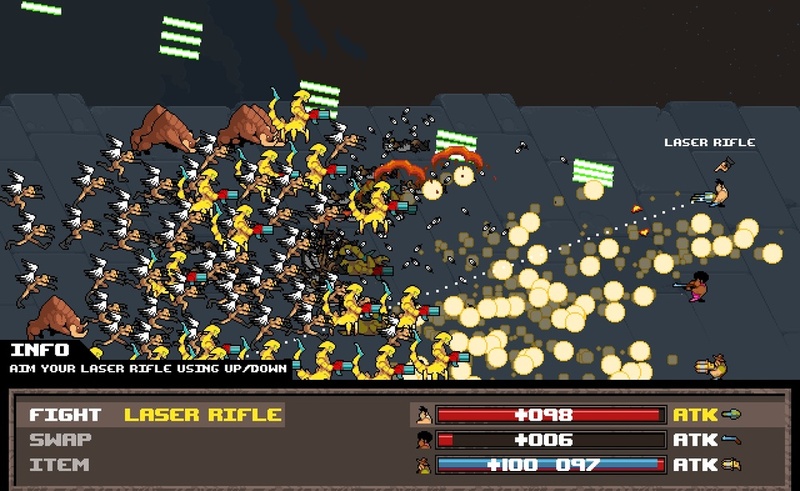 Like many turn-based RPGs, TRE features both a top-down view of the world and an up-close battle mode. 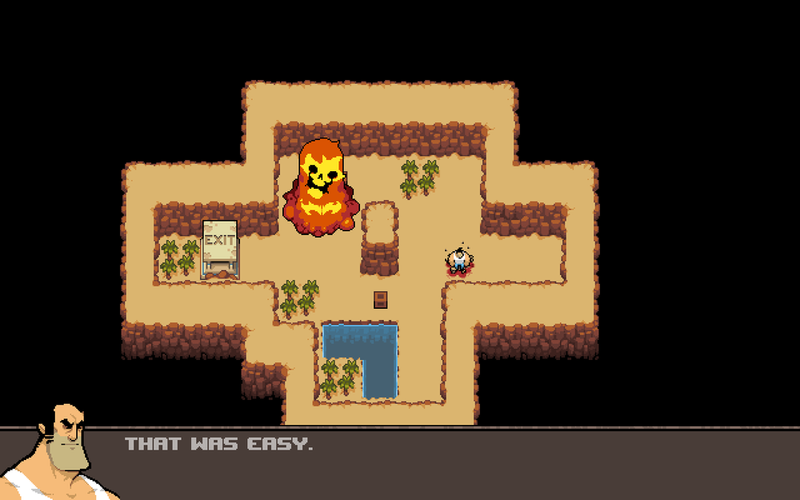 In the top-down portion, you move through the map in normal fashion, picking up new party members and weapons along the way. In the battle portion of the game, Sam and his friends line the right side of the screen running backwards, shooting enemies that come from the left side of the screen. Your only direct control over Sam is vertical movement. In this way it’s kind of like an inverted side-scroll shoot ‘em up. Now, in true Serious Sam style, the game will literally throw a hundred enemies at you at a time, thus it’s not a true turn-based game in the sense that you attack, then your enemy attacks. Instead, the game pauses every 5 seconds for you to change weapons, heal, and whatnot. Then, when you’re done, you continue to fight for another 5 seconds. This is where the strategy in the game comes in. Some weapons like the Rocket Launcher only fire once per round while others like the Revolver fire multiple times. Some shoot in a spread while other fire in a straight line. Some weapons may be useful for one 5 second period and not another and healing means that you cannot fire at all. So you have to decide which characters need which weapons or power-ups for your given situation. Just like TRE is not quite truly turn-based, it’s not really an RPG either. There’s no character development what so ever. This was the biggest bummer for me. The closest thing you will get to leveling up is finding new weapons and power-ups such as extra damage or the ability to revive a fallen teammate. Serious Sam: The Random Encounter features a classic 8-Bit art style which suits its gameplay well. There’s nothing that really stands out as being particular awesome, but it’s well done all the same. The animation of the characters is very nice and it’s really quite cool to see Mental’s horde 8-Bitified. The soundtrack is equally retro-inspired and is one of my favorite parts of the game. TRE is a short lived experience that, for most people, will last between one and two hours. This is a good thing considering I have literally explained all that TRE has to offer. It would have been nice to see the game last a little longer, but that would have required some sort of character progression to deepen the gameplay. As it stands, the length and depth definitely complement each other. Once you beat the campaign, you unlock Endless Mode, which allows you to fight an infinite number of enemies. But it’s not just you running backwards without stopping. You start in a top-down world like all the others and every time you move, you enter battle mode. As you complete waves of enemies, you get more weapons and power-ups. Though I enjoyed the main game, I didn’t have much desire to play Endless Mode. Serious Sam: The Random Encounter is a fun, albeit short game that delivers where Serious Sam games try too, with shallow but dumb fun. The humor is great, graphics are nice and the game is fun while it lasts. TRE doesn’t do a whole lot, but what it does is fun and I would say that that fun is well worth a purchase especially if you’re already a fan of Sam. Serious Sam’s Bogus Detour is a seriously fun game bogged down by a couple of serious problems. If you’re a big Serious Sam fan, have online friends to play with, or you’re just looking for a challenging twin stick shooter, then this game is worth its $15 price tag. Splinter Cell Blacklist is a good game. Actually it's a great game. The action is tight, the missions are fun and customization is deep and varied. Amalur is a fun game that’s well built and does its own things very well. Personally, I don’t see it winning any awards at the end of the year, but if you like high fantasy and games that will keep you busy for hours with a great number of quests and activities, Amalur is certainly well worth your money. However, if you’re already entrenched in Skyrim, holding off on this one for awhile might be a good idea, lest you suffer from open world RPG burnout.